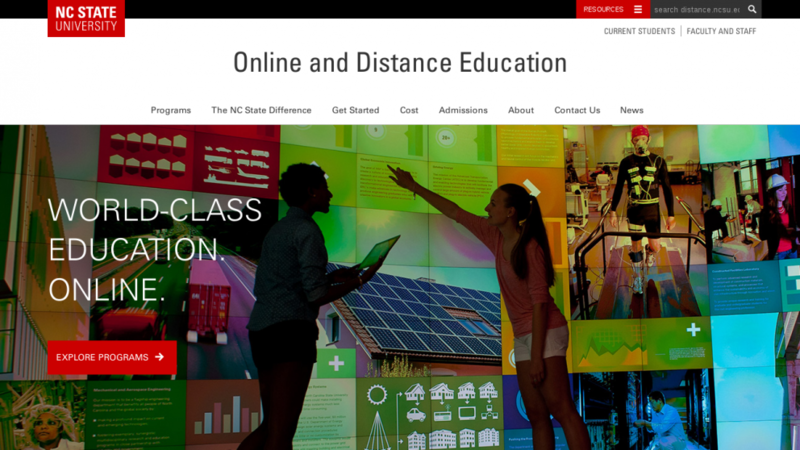 The NC State Distance Education website has a new name and a new look. On Thursday, Aug. 4, DELTA launched the new NC State Online and Distance Education website. One of the goals of the redesign was to make the website more user-friendly to prospective and current students. Students can easily research programs that suit their needs and demands of a busy lifestyle. As part of the decision to rename the website, DELTA conducted research based on search engine optimization (SEO) both in North America and abroad. DELTA also sought input on a new name from prospective students, senior administrators, deans, department heads, DE faculty and DE program coordinators. The Online and Distance Education name generated positive feedback, including the expectation that more hybrid courses would be available to students. Online and Distance Education programs were also perceived as being more flexible and convenient to students, which are key factors for students considering to further their education through online and distance education. Another aspect of the new website is a news blog, a site that highlights our current students, successful alumni, our competitive programs, plus awards. With the launch of the new website, NC State Online and Distance Education also launched four new social media channels as a way for future students to learn about our programs as well as to provide current students with the proper tools to continue to be successful in our online and distance education programs.